The versatility of dumbbells are apparent. That’s why the fitness magazines frequently show all-dumbbell workouts, and why programs like P90X are so popular. You can do a ton of different exercises with just a pair of cheap dumbbells. But the limitations of dumbbells are also obvious. The stronger you get, the bigger dumbbells you’ll need, and while buying a couple pairs of cheap dumbbells isn’t too bad of an option to start, you will quickly outgrow them. I’ll start with a quick trip back to my formative years, when my brother and I worked out with those cheap, plastic-coated weights in our parents’ basement. Each of our weight sets came with a couple of dumbbell handles. One had collars that you tightened with a wrench. The weights stayed in place, but changing them was laborious, time-consuming, and even bloody if we weren’t careful with the wrench. Some years later I bought a set of threaded dumbbell handles. With a couple of spins of the collars you could change weights in seconds. Problem was, the damned collars didn’t stay spun, forcing me to cut sets short or risk having plates slip off the handle and crash to the floor. 1. Buy individual dumbbell pairs. Easy to understand: Figure out the lightest and heaviest weights you need, and everything in between. Then buy a pair of each. This quickly gets expensive and takes up too much space! 2. Buy a set of adjustable dumbbells. You get a pair of high-tech dumbbells that start at 5 or 10 pounds and go all the way up to 90, These sets take up the space of a single pair, and are often less expensive than buying an entire rack of individual dumbbells. This is your best option. 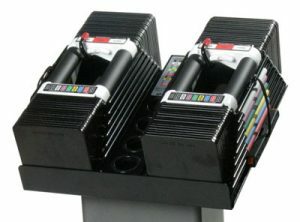 Some manufacturers sell individual adjustable dumbbells. We don’t recommend going that route. 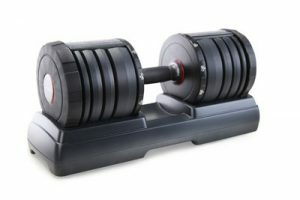 It is a much better decision to cough up a little more dough and purchase a full set of two adjustable dumbbells. This allows you to perform a much wider range of exercises than with a single dumbbell. Adjustable Dumbbells are also a great tool to have for p90X. 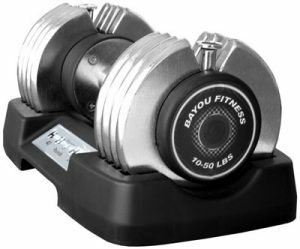 We looked at all the options, compared reviews from every hidden crevice of the internet, and even got to try all of these adjustable dumbbells sets ourselves. We have done the research for you. Your search stops here, let us present the best adjustable dumbbells for sale in 2015. Includes “Secrets of the 4-Step Rep” DVD with more than 30 exercises. Two year warranty on weight plates and parts. Offers maximum weight of 90 pounds per hand; limited 10-year warranty. 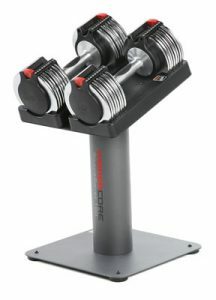 Includes dumbbells, cast iron weight plates, hand grips, storage trays and weight stand, 90 day warranty. Easy operation: just adjust selector to weight, lock it in, and lift. Offers maximum weight of 45 pounds per hand; limited 10-year warranty.